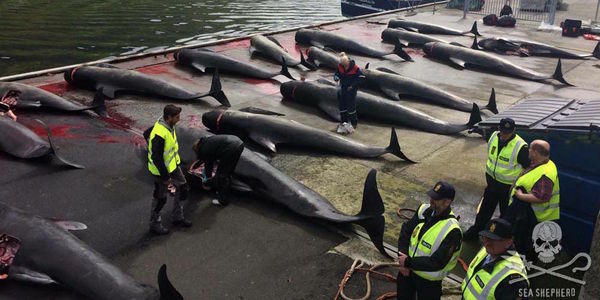 Petition: URGENT: Hold Denmark Accountable for the Slaughter of Pilot Whales! URGENT: Hold Denmark Accountable for the Slaughter of Pilot Whales! Danish officials, including police, navy, and customs representatives, have been facilitating and supporting the slaughter of cetaceans in the Faroe Islands. In events known as "grindadráps," Denmark assists the Faroese with ensuring that they can drive hundreds of pilot whales and other cetaceans into bays, where, while screaming in terror, their spinal columns are ruthlessly sliced, filling the bays full of blood. UPDATE: After receiving over 240k signatures, Sea Shepherd has submitted the petition to the European Commission, which has acknowledged receipt of our request to start infringement proceedings. Share the petition to keep the pressure on the EC.Thank you all for your support, and visit the campaign page on our website for the latest updates.